The USD/CAD extended its falls and for good reasons. 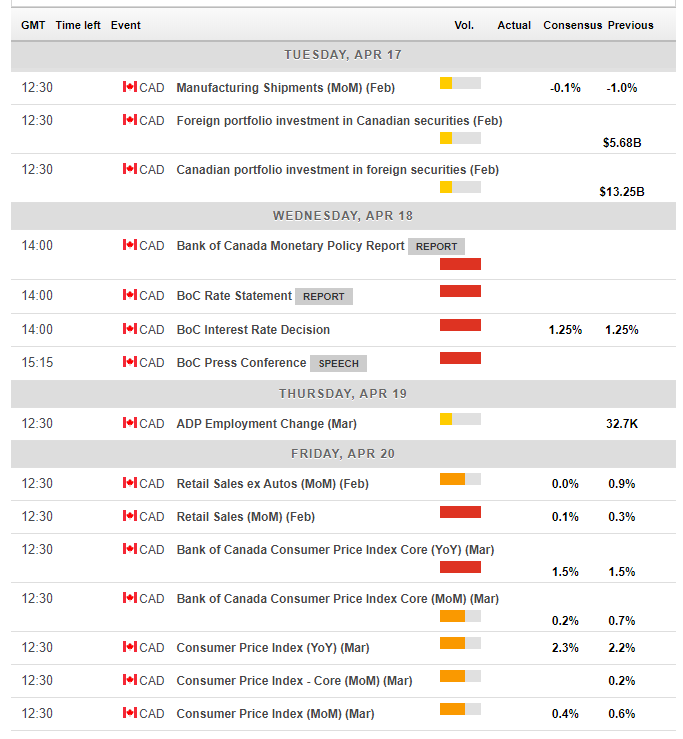 A busy week with a rate decision, retail sales, and inflation data awaits the loonie. The technical picture for the USD/CAD is bearish with oversold territory getting near. 1) Higher oil prices: Prices of both WTI Crude Oil and Brent reached the highest levels since 2014. The tensions around Syria contributed to the move, but the fundamentals of supply and demand are currently favorable for Canada's crucial export. 2) NAFTA is getting closer: A deal on the North American Free Trade Agreement was not reached before the Western Hemisphere Summit in Lima, but all sides remain optimistic. Also, Trump has opened the door to the US re-entering the TPP agreement which includes both Mexico and Canada. 3) Upbeat BOC: The Bank of Canada's Business Outlook Survey showed optimism about the economy. They did not hint of rate hike, but the upbeat mood was supportive. 4) Defusion of tensions: After things heated about around Syria, there are reports about conversations between the US and Russia around the Middle Eastern country. These lower tensions help risk assets like the Canadian dollar. Not all was A-OK as Canada posted mixed figures: Building Permits fell by 2.6% while Housing Starts beat expectations with an annualized level of 225,000. Also, the US Dollar got support from a rise in US inflation (as expected) and also from upbeat comments by Fed officials regarding raising rates. The FOMC Meeting Minutes showed confidence about inflation reaching its target. The Canadian economic calendar kicks off on Tuesday with the Manufacturing Shipments and Foreign Portfolio Investments. However, the big development of the week waits for Wednesday. The Bank of Canada makes its rate decision and also holds a press conference led by Governor Stephen Poloz and Deputy Governor Carolyn Wilkins. The Ottawa-based institution is expected to leave the interest rate unchanged at 1.25%, but they may sound a bit more optimistic after the recent rise in jobs. Besides, the higher chances of a NAFTA deal may lead them to indicate a rate hike later this year. In the previous events, the BOC expressed concern over trade negotiations and reiterated the importance of a deal. Now, they may change their tune. As the BOC does not always send hints about future moves, a rate hike now cannot be ruled out. This is not priced in and may cause a spike in the value of the Canadian Dollar. The tone of the press conference is no less important than the text of the statement. 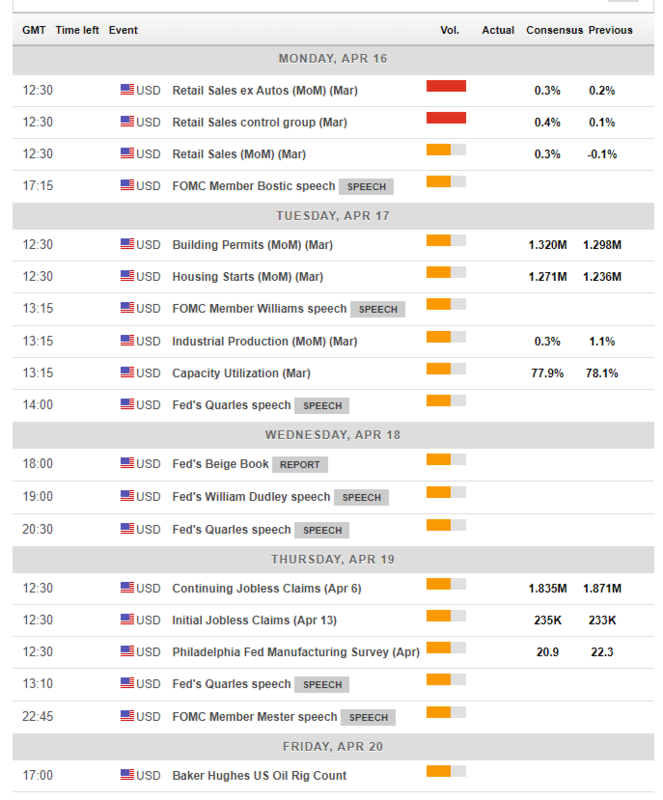 Thursday will allow for digesting the BOC decision, and the ADP Employment Change may be overshadowed by the events of the previous day. Oil inventories have rising importance as oil prices remain close to the 3-year higher. On Friday, things heat up again with the double-feature Retail Sales report for February and the Inflation data for March. To see a meaningful reaction, both events need to go in the same direction and not offset each other. Retail sales are projected to increase by only 0.1% on the headline and remain flat on the core. These low expectations could result in a positive surprise. Inflation numbers are projected to be stable: headline inflation carries expectations for ticking up from 2.2% to 2.3% YoY. Core CPI will remain unchanged according to the early forecasts. Also here, low expectations can result in a rise. All in all, this will likely be an eventful week for the Canadian dollar. The most important American gauge is released early on: Retail Sales are expected to pick up in March after a poor outcome in February. Later on, housing data is of interest and so is the Fed's Beige Book, an overview of the economy. The more meaningful events from the Fed comes from its speakers, with incoming New York Fed President John Williams standing out. His speech on Tuesday may indicate an upgrade to four hikes in 2018. The outgoing President Dudley and other officials have speeches spread out during the week. Politics will remain left, right, and center. For Canada, the fate of NAFTA is the most important event, but everything is related. Currently, the Administration is leaning towards trade deals, but the mood may change rapidly. Events in Syria and also those related to the Mueller Investigation should be watched. A lot depends on Trump's mood. 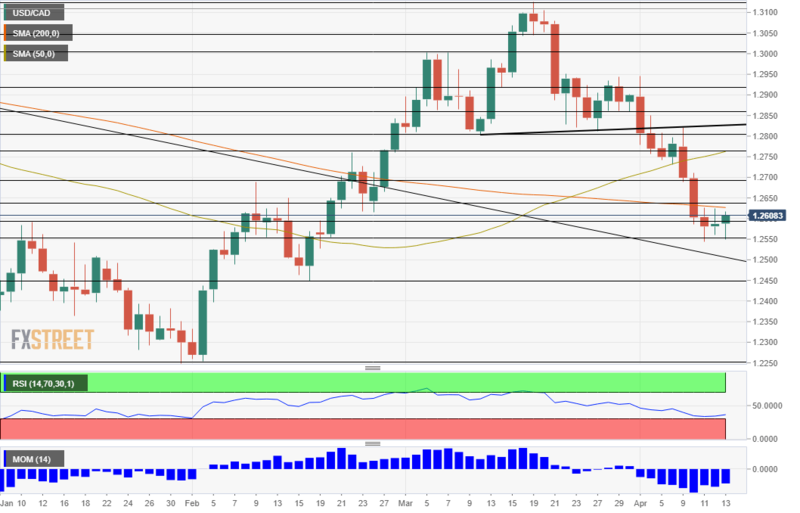 The USD/CAD broke below critical support (the thick black line) and continued downhill from there. On the way, it pierced through the 50-day Simple Moving Average and eventually the 200-day SMA. The upside cross of these two lines has not resulted in a recovery. The RSI shows that the pair leans lower, but nears oversold territory. Momentum is robust to the downside. Support appears at the mid-April lows of $1.2550, a triple-bottom on the chart. Further below, we are back to levels last seen in mid-February: 1.2450. Even lower, the round number of 1.2400 works as the next line of support. Looking up, there are plenty of resistance lines. 1.2630 capped the pair in mid-April and is also where the 200-day SMA comes out. Further above, 1.2680 was a swing high in early February. Even higher, 1.2760 was another swing higher later that month. The Canadian Dollar had good reasons to rise, and it now faces more significant test. A cautious central bank and a souring mood in the White House may reverse its course, but there is a higher probability to see optimism from the BOC and no imminent disasters regarding NAFTA. The pair may extend its falls before pausing due to oversold conditions. The FXStreet Forecast Poll shows further falls in the near and medium terms before rising in the longer term, similar to the opinions expressed here.